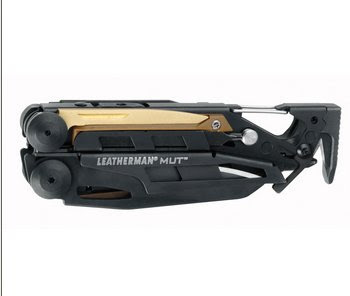 There are a sea of multi-tools now on the market however the original Leatherman continues to prove again they are still the most creative muti-tool engineering company in the world with the introduction of the Leatherman MUT. 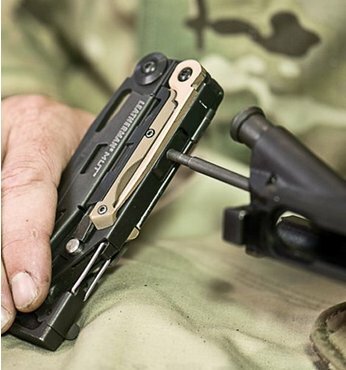 The Leatherman MUT AR15 Multi-tool is not only a work of incredible engineering but a work of industrial art and It is the quintessential tool for any AR15 owner. 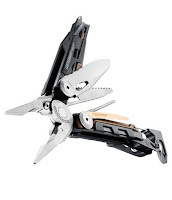 As with any Leatherman Multi-tool the MUT has a perfect fit and finish. Everything fits well, there is no binding and all the tools can be deployed as designed. 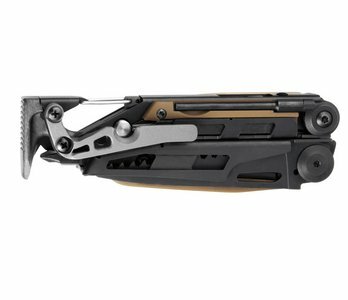 With so much densely packed into the confines the tool and engineering for durability, the Leatherman MUT has some heft at 11.2oz and feels substantial, but is worth every once in the utility it provides. The Leatherman MUT is the first multi-tool every conceived to provide both general practical tools and support for AR15 military, LE, and civilian shooters. 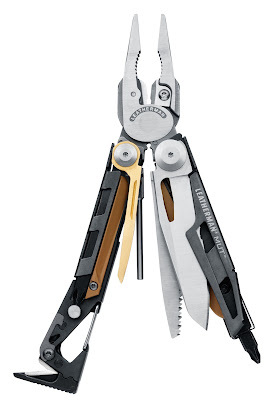 It is available in standard or black oxide finish and has the usual pliers with wire cutters, one handed opening partially serrated and saw blades but Leatherman has put a unique spin on the bits and then added some unique weapon maintenance focused tools. These unique tools include threaded pliers sides for attaching standard AR cleaning rods and brushes to use the MUT as a cleaning rod handle. 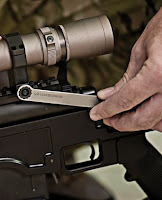 The pop out screwdriver, torque and hex bits are sized for standard military and civilian sighting adjustment work including a non-attached double ended ½” & ⅜” accessory wrench. 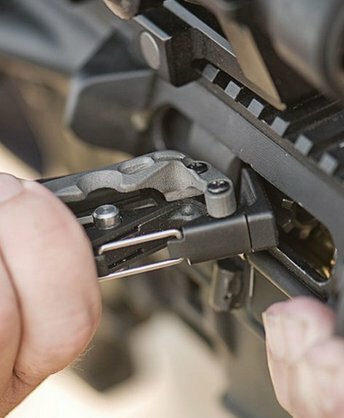 With these bits and accessories, you can not only maintain your AR, but also mount, adjust and secure optics as well with the right tools for the job. In the head of the tool Leatherman has integrated a hammer, bolt clearing/over-ride tool, and webbing cutter and just below that is a lock to prevent the tool from un-locking if used as a hammer... all very unique, useful, and cleverly engineered tools out in the field. As noted the tool also feature a carbon scraper and punch. The design of the Leatherman MUT all the way to the MOLLE sheath was developed to be fast to deploy in harsh combat environments for service or repair an AR. 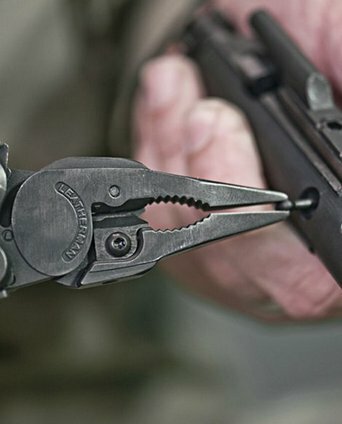 Even the integrated take down punch has dual use, pull it open in a hurry to push out a stubborn pin to disassemble the upper, or un-screw the punch and and use it separately with the hammer end of the MUT and you have a hammer and punch combo that is extraordinarily useful even on the workbench. There is also a brass carbon scraper blade to aid with safe cleaning. My only gripe is that I wish it had a can opener, but I am sure you could open a can with the one of the tools. The Leatherman MUT has proven to be such a useful tool that I find myself reaching for it even when doing maintenance on the bench. 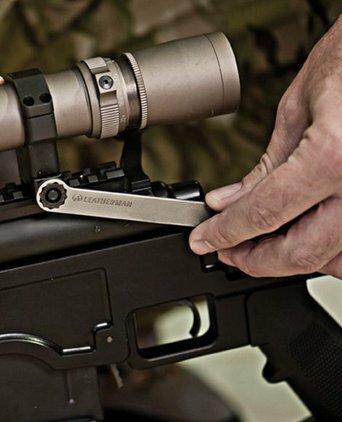 The most important feature is that this tool puts a toolbox of firearm maintenance right on your belt which can be quickly deployed when the need arises. The bolt override works great to manually grip and rip the bolt in at least the simulated dry fire drills I did. Apparently I need to stop cleaning my AR’s so I have more jams to try the feature out for real. 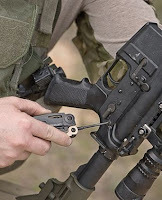 One other handy feature is the integrated carbiner clip which adds another carry option beyond the sheath. 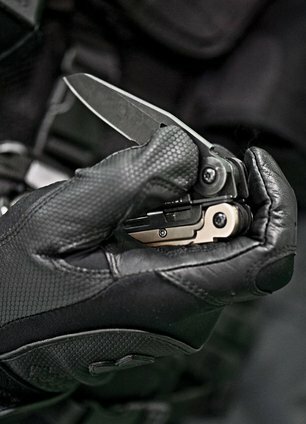 The sheath is absolutely without the question the finest sheath I have seen on any knife or multi-tool and let’s not forget that is were the incredible Leatherman MUT will be stashed, carried and deployed from 99% of the time. 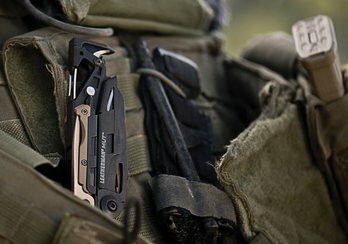 Simply put, if you own and AR you will find the Leatherman MUT infinitely useful.